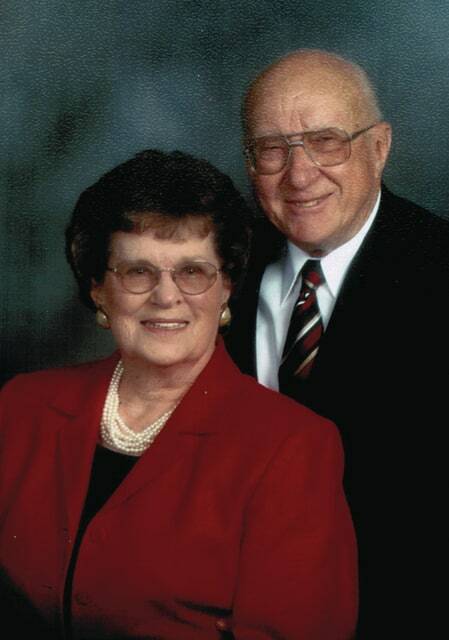 Carl and Opal Holfinger will celebrate their 70th wedding anniversary on June 9, 2015. Both raised on farms, Opal and Carl met during harvest season when their families worked together to run the threshing machine. Carl, from Troy, bet Opal his Troy Trojans would beat her Piqua Indians in the upcoming football match. Carl lost the bet, but won the girl and they have been married 70 years. They were married June 9, 1945, at St. Paul’s Church in Piqua, Reverend Gehm officiating. Together they raised two children on their farm in Concord Township. Son Gary Holfinger and daughter-in-law Jeanne live in Perrysburg. Daughter Carla Rowe and her husband Jack reside in Tipp City. They relish their days of raising beef cattle and harvesting corn, soybeans and wheat. Opal says her husband’s “first love” was raising beef cattle before retiring from farming at the age of 80. They have enjoyed their volunteer work for both Miami County and the State of Ohio which include 4-H Clubs; parish leaders in their church; Miami County Farm Bureau; the State Farm Bureau; Board of Directors for Troy Elevator; Beef Commission; Ohio Cattleman’s; Ohio Bicentennial Board; and Ohio Expo Commission.